Weatherspoon & Voltz has been selected for inclusion in U.S. News & World Report and Best Lawyers’ list of “Best Law Firms” for 2019 as a regional Tier 1 firm for Real Estate Law. 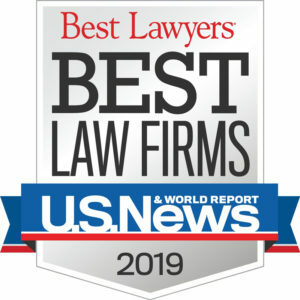 Firms included in the 2019 edition of “Best Law Firms” are recognized for professional excellence with consistently impressive rakings from clients and peers, Achieving a tiered ranking signals a unique combination of quality law practice and breadth of legal expertise. Ranked firms, presented in three tiers, are listed on a national and regional-based scale. Firms that receive a tier designation reflect the high level of respect a firm has earned among other leading lawyers and clients in the same communities and practice areas.